The easiest way to install macOS is from the App Store app. For example, learn how to install the latest macOS version from the App Store. If you’re reinstalling because you’re preparing to sell or give away your Mac, you should disable certain features and services first, then follow the remaining the steps in this article. If you don’t have the App Store, can’t access it, or are selling or giving away your Mac, follow these steps. Requires macOS Sierra 10.12.4 or later Install the macOS that came with your Mac, or the version closest to it that is still available. * If you’re selling or giving away a Mac that is using OS X El Capitan or earlier, use Command-R to make sure that the installation isn’t associated with your Apple ID. ** If you haven’t already updated to macOS Sierra 10.12.4 or later, Option-Command-R installs the macOS that came with your Mac, or the version closest to it that is still available. When you see the macOS Utilities window, continue to the next section to determine whether to erase your startup disk or begin installing macOS. You’re selling or giving away your Mac, so you’re clearing your Mac of anything associated with you, your data, or your Apple ID. You’re trying to resolve an issue that Disk Utility can’t repair. The macOS installer says that it can’t install on your computer or volume. For example, it might say that your startup disk isn’t formatted correctly, isn’t using a GUID partition scheme, already contains a newer version of the operating system, or can’t be used to start up your computer. If none of the circumstances above apply to you, skip to the next section to install without erasing. Erasing your disk permanently deletes all of the data stored on it. 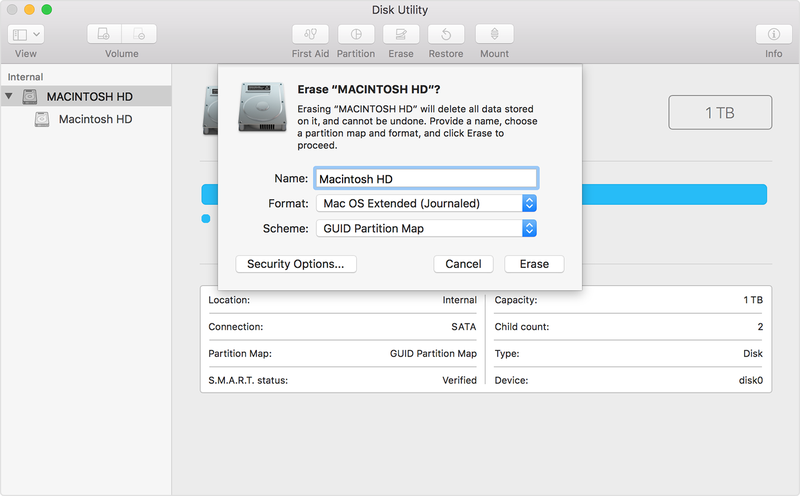 Select Disk Utility from the utilities window of macOS Recovery, then click Continue. Select your device or volume in the sidebar of Disk Utility. Name: Enter a name for your disk, such as “Macintosh HD”. Format: Choose Mac OS Extended (Journaled) or APFS. Scheme (if available): Choose GUID Partition Map. Click Erase to begin erasing your disk. When done, quit Disk Utility to return to the utilities window. You’re now ready to install macOS. Click Continue, then follow the onscreen instructions. You’ll be asked to select your disk. If you don’t see it, click Show All Disks. Click Install. Your Mac restarts after installation is complete. If you erased your disk before installing, or you installed on an external drive or other new disk, your Mac restarts to a setup assistant. If you’re keeping your Mac, complete the setup assistant with your own information. If you’re selling or giving away your Mac, press Command-Q to quit the setup assistant without completing the setup steps. Then click Shut Down. When the new owner starts up the Mac, they can use their own information to complete setup. If you have more than one disk that contains a compatible macOS installation, you can use Startup Disk preferences or Startup Manager to choose which disk to start up from.